2014 MVP Maya Moore scored a playoff career-high 32 points, Lindsay Whalen continued her fantastic play with 17 points and 7 assists and Seimone Augustus hit the free throws late to ensure Minnesota didn’t suffer the franchise’s first elimination on its home floor. Although the Mercury leave Minneapolis disappointed, there are some things they can build on for Game 3. Heading into Sunday afternoon’s Game 2 of the Western Conference Finals, both the Minnesota Lynx and Phoenix Mercury seemed confident they’d be able to make the necessary adjustments. The Mercury would want to continue most of the Game 1 performance while managing to quell the fourth quarter spurt the Lynx had on Thursday night at the US Airways Center; on the other hand, the Lynx would want to wipe the slate clean and jump out to better start in front of their home crowd. Although Game 2 was reminiscent of the first outing early on, the third quarter brought a glimpse of what the WNBA’s two top offenses like to do best. The Lynx were able to get Maya Moore a couple open looks from three while Seimone Augustus was able to get to the rim off the bounce. Phoenix, meanwhile, pounded the ball into Brittney Griner and took advantage of the nightly mismatch she provides while Diana Taurasi and Candice Dupree filled in the gaps with momentum-stopping buckets. But after the third quarter ended with Minnesota outscoring Phoenix 20-18 to cut the Phoenix lead to six, the fourth quarter began and Phoenix’s worst nightmare materialized. The Lynx opened the fourth quarter with a 13-0 run, kick-started by three triples from 2014 MVP to get the home team out and running for the first time in the series. The final three came one possession after a Mercury timeout to give the Lynx a 69-65 lead with 5:57 left in the game. The Mercury played a few good possessions of defense to tie the game up but in the last four minutes, Minnesota had its way. Cheryl Reeve called veteran Seimone Augustus’ number as she collected the ball and was aggressive, getting to the free throw line and making 5 of 7 attempts in the last 3:39. Moore and Brunson knocked down two apiece behind Augustus’ final tallies before DeWanna Bonner, who finished 0-for-6, missed a 36-foot three that Taurasi boarded and put-back for the final margin of 82-77. Moore led Minnesota with a playoff-career high 32 points to go along with 9 boards. Augustus had 23 and Whalen 17 to account for 72 of the Lynx’s 82 points (or 88% of the team’s scoring). What the game came down to for Cheryl Reeve’s squad was going back to the basics. This team was built on the basis of their Olympic trio of Whalen, Augustus and Moore, while adding solid pieces to complement their All-World talent. But in Game 2, Minnesota simply took looks away from those complementary pieces (Brunson’s shot attempts from 7 to 5 from Game 1 to Game 2, Janel McCarville’s from 9 to 3, Monica Wright from 7 to 3) and increased its looks for its Big Three. Moore made five threes on the way to her new playoff career high and Augustus found her way back upwards towards her regular season field goal percentage while making a living at the free throw line (8-10). All of this was in conjunction with the continued excellence of homegrown star Lindsay Whalen: after taking 25 shots and being aggressive in Game 1, she followed with another strong performance in Game 2. In the second quarter, Lindsay Whalen continued her fantastic play in the playoffs while MVP Maya Moore finally broke through to put her stamp on this series as the Olympians combined for 21 of the Lynx’s 27 total points in the quarter. Whalen finished with a solid 17 points –15 in the first half to keep the defending champs within reach– and 7 assists,four of which came in the fourth quarter as Moore and Augustus took over. Aside from Moore’s scoring explosion, the only major differences in the Lynx squad’s two games was playing the Mercury almost even on the boards and sharing the ball a bit more. For the Mercury, Phoenix will be disappointed to have blown a 13 point lead, as they received 23 points, 6 boards and 5 assists from Diana Taurasi. 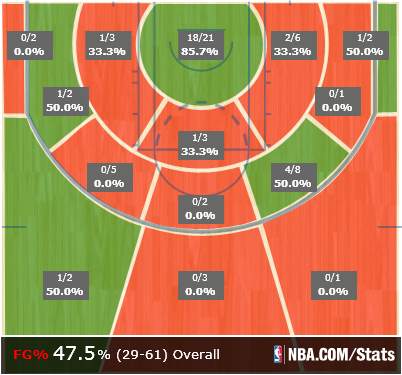 However, Taurasi’s 23 came on 23 shots. Dupree chipped in 18 and 9 boards to anchor the Mercury’s frontcourt play, but Brittney Griner was a bit frustrated and didn’t impact the game as much as she has recently but still finished with 14 points and 3 rejections. The Mercury’s shot chart in Game 2 The Mercury struggled with their shooting efficiency in the fourth quarter (35.3%), but their offensive advantage remained clear on their shot chart for the game. When you look at the raw numbers, it shows that Phoenix didn’t shoot the ball all that badly.The Mercury dominated in the paint early on by catching Minnesota gambling and setting fantastic screens, finishing the game 18-21 in the paint, and were actually 15-for-15 in the key before a Dupree miss from 8 feet at the 6:04 mark. But their 47.5% shooting from the field hides 4-for-18 (22%) shooting from three by the league’s second-best 3-point shooting team. Yet what the Mercury will be very unhappy about is the defensive end. The Mercury jumped out to leads of 8-1 and 11-3 in the first quarter before settling into a 22-9 advantage behind stellar free throw shooting and 6 points and 3 boards from Candice Dupree. The Mercury did a fantastic job defensively of keeping the Lynx out of rhythm early on, holding Minnesota to shoot 2-14 in the first quarter. However, their defense showed some cracks in the second half. Phoenix let Minnesota back into this game by allowing them to get out in transition and score easy buckets for themselves. Minnesota only outscored Phoenix 13-9 in fast break points, but also had 22 points off of 15 Mercury turnovers. It became a domino effect as the crowd got involved and the Olympic trio started to see the basket a bit better. Going into Game 3, Phoenix will definitely want to be more aggressive in establishing Griner inside. She was still an efficient 6-for-8 from the field and made both her free throws, but she never seemed comfortable and was frustrated all night long, even picking up a technical for jawing with Seimone Augustus in the third quarter. Bonner going 0-for-6 and Taylor spending most of the night on the bench in foul trouble nullified the spark that Erin Phillips brought with 10 points (2 triples), 4 boards and 4 assists in 19 minutes. Going back home with the X-Factor behind them, the Mercury will have a chance to show what they worked all season to guarantee, albeit not on national television (SOMEBODY FIX THIS!). Meanwhile, Cheryl Reeve’s squad is seeing their first real test in a playoff series since losing to Indiana in four in the WNBA Finals in 2012 so it’ll be interesting to see how they respond. For more on the game and the series, check out our Mercury vs. Lynx storystream. Poll How do you see Game 3 ending? Just give me an entertaining, high-intensity game and I’m happy! Who do we have to find to get this game on national television?? !